The Yutu moon rover is seen on Dec. 22, 2013. On January 10, 2014, the Chinese Academy of Sciences published photographs of the moon and Earth taken by the Chang'e 3 lander and Yutu rover during the period of Dec. 14-26, 2013. The Chinese spacecraft landed on the moon on Dec. 14, 2013. China's Jade Rabbit moon rover may have stubbed its lucky foot. The state-run Xinhua news agency reported Saturday that China's Yutu moon rover(the name means Jade Rabbit) "has experienced a mechanical control abnormality, and scientists are organizing repairs." Chang'e 3 Moon Lander is seen on Dec. 22, 2013. On January 10, 2014, the Chinese Academy of Sciences published photographs of the moon and Earth taken by the Chang'e 3 lander and Yutu rover during the period of Dec. 14-26, 2013. The Chinese spacecraft landed on the moon on Dec. 14, 2013. The issue with the solar-powered rover robot emerged as it entered its second hibernation period on the moon Saturday (Jan. 25) as the lunar night fell, according to SASTIND officials. Earlier on Friday, (Jan. 24) the Chang'e 3 lander also went into its own scheduled hibernation. The Chang’e 3 moon mission survived its first chilly and lengthy lunar night in early January. A 360-degree panorama shows the surroundings of the Chang'e 3 lander on Dec. 17-18, 2013. On Jan. 10, 2014, the Chinese Academy of Sciences published photographs of the moon and Earth taken by the Chang'e 3 lander and Yutu rover during the period of Dec. 14-26, 2013. The Chinese spacecraft landed on the moon on Dec. 14, 2013. Hardware survival on the moon is considered a major triumph, with the lander and rover using novel thermal technology, solar panels and so-called "nuclear batteries." The Chang'e 3 mission landed on the moon Dec. 14 Beijing time, making China only the third country in the world to achieve such a moon feat after the former Soviet Union and the United States. The lander and its rover set down on Mare Imbrium (Sea of Rains) just east of an over 1,475-foot (450 meters) diameter impact crater. The mobile Yutu rover is designed to operate for at least three months, while its stationary lander is expected to work for one year. Both the instrumented lander and the six-wheeled Yutu rover are being controlled from the Beijing Aerospace Control Center (BACC). China's Chang'e 3 moon lander carries a six-wheeled Yutu rover vehicle on its back. See how the Chang'e 3 moon rover mission works in this SPACE.com infographic. After awaking from its first hibernation period, the Yutu moon rover completed its first "taste test" of lunar soil using its sensor-mounted robot arm. "Accuracy control of the mechanical arm at a distance of 380,000 kilometers has been realized in the probe, marking China's breakthrough in controlling a mechanical arm with high precision on the lunar surface," said Wu Fenglei, deputy director of the system design department at the BACC, according to Xinhua. An early look at how the Chang'e 3 mission is behaving has also been released by the Chinese Academy of Sciences (CAS). Yutu moon rover was photographed by the Chang'e 3 lander on Dec. 16, 2013. On January 10, 2014, the Chinese Academy of Sciences published photographs of the moon and Earth taken by the Chang'e 3 lander and Yutu rover during the period of Dec. 14-26, 2013. The Chinese spacecraft landed on the moon on Dec. 14, 2013. The Chang'e 3 lander is equipped with four instruments: an optical telescope, an extreme ultraviolet camera, a landing camera, and a topography camera. The Yutu rover, meanwhile, carries four instruments of its own: a ground penetrating radar, a particle excitation X-ray spectrometer, an infrared imaging spectrometer, as well as panoramic camera. According to CAS, the scientific goals of China's first robotic lunar landing are divided into a trio of assignments: investigating the surface of the moon, observing the sky and monitoring the Earth. Except for the particle excitation X-ray spectrometer and the infrared imaging spectrometer, the other instruments were powered on shortly after the Chang'e 3 lander's touchdown. Science data from the moon-based equipment were received by two ground stations, one in Beijing and the other in Kunming, situated in Southwest China. On Jan. 10, 2014, the Chinese Academy of Sciences published photographs of the moon and Earth taken by the Chang'e 3 moon lander during the period of Dec. 14-26, 2013, including this vi ew of Earth from the lunar surface. The Chinese spacecraft landed on the moon on Dec. 14, 2013. Between Dec. 14 and 26, the rover and lander spent their first lunar day on the lunar surface. Eight sets of scientific instruments were powered on and tested. "In the test phase, all of the instruments worked as well as expected. Large amounts of science data had been received," according to the preliminary science document, translated and provided to SPACE.com by Yong-Chun Zheng of the National Astronomical Observatories, Chinese Academy of Sciences (NAOC). This image shows stars in the night sky as seen from the moon by China's Chang'e 3 lunar lander, which is equipped with a lunar-based optical telescope. For example, a view of Earthrise on the moon was captured on Dec. 23 by the lander's topography camera. Also, the lander-mounted optical telescope observed three different patches of the sky in the near ultraviolet band on Dec. 16, taking in 23 stars located in the constellation Draco. Imagery of the Earth's plasmasphere was taken Dec. 16 by the lander’s extreme ultraviolet camera. Meanwhile, the nearly 310 lbs. 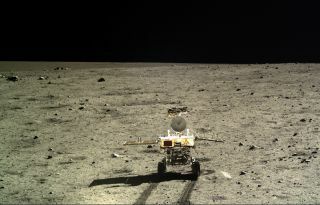 (140 kilograms) Yutu rover was busy too, making use of a belly-mounted Ground Penetrating Radar (GPR). The subsurface structure of the landing site was profiled at different depths, using two GPR observation channels. Data collected by the rover's particle X-ray device has helped scientists identify 11 types of chemical elements on the moon, such as magnesium, aluminum, calcium and yttrium. Just as the moon is Earth's partner in gravitational embrace, the gravity well of politics and science is always near at hand. Gregory Kulacki, Senior Analyst & China Project Manager of the Union of Concerned Scientists' Global Security Program in Cambridge, Mass., said it would be refreshing if the news coverage of the Chinese moon program focused more on science than on politics. "While many U.S. observers seem to believe China's primary motivation is to make a political statement, the Chinese scientists and engineers who conceived, designed and implemented the Chang'e program want to be recognized for the contributions they may be able to make toward our understanding of the moon," Kulacki told SPACE.com. Kulacki said that while there are those that never hesitate to warn Americans that China may send people to the moon — as if that were somehow a threat to the United States — China has made it very clear that they would like to make such an effort together with international partners, rather than being forced to go alone. "If the United States continues to rebuff Chinese efforts to reach out on space cooperation, the day may come when China organizes its own international effort for a human lunar mission with partners in Brazil, India, Japan and South Korea," Kulacki said. "The Chinese have already indicated that China's national space station, expected to be completed in the early years of the next decade, will be open to scientists and astronauts from other countries." "This is the first time that China has attempted a landing on another planetary body and it was picture perfect," said Jack Burns, Director of the Lunar University Network for Astrophysics Research (LUNAR) at the University of Colorado, Boulder. He underscored how open and confident China was in broadcasting the Chang'e 3's landing and deployment of the Yutu rover on live TV. "These are firsts and I hope this bodes well for the future. I do hope this opens opportunities now for real collaborations with the west. For China's previous orbiting missions of the moon, there was little or no sharing of data at conferences or in publications that I’m aware of. Chang'e-3 is potentially a start of a new openness," Burns said. As for future collaboration, as China's rover examines lunar samples, "there are lots of opportunities for collaborations," Burns concluded.